Great news for travelers planning to visit Batanes, Boracay, Coron and Siargao! Here is your chance to get promo fares to these amazing destinations. Dubbed as SKYJET PAYDAY FEVER, tickets from this seat sale are valid for trips on the following dates: August 18-31, September, October, November, December 2017. Here is the 2017 List of Holidays and Long Weekends to aid you in planning your travel dates. There are 2 long weekends this month starting on August 19- August 21 (for Ninoy Aquino Day) and for next weekend (August 26- 28, 2017) in celebration of National Heroes Day. Avail the promo tickets from August 17- 20, 2017 via online booking at www.skyjertairlines.com. Good for one-way trip, Skyjet promo fares are limited and not available during embargo period. 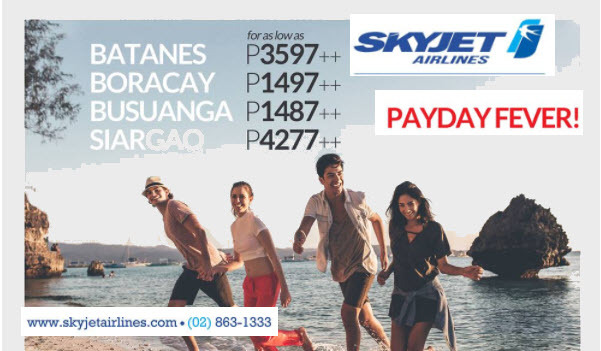 Skyjet affordable fares include the base fare, VAT, free 5 kilos cabin baggage and checked baggage of 10 kilos (adult passengers) and 5 kilos for children. Baggage more than the allowed weight will be charged at P150/kg, VAT inclusive. Skyjet sale tickets are non-refundable, cannot be re-booked, non-reroutable, non-endorsable and non-transferable. Do you want to avail the Skyjet promo fares? To get the low fares, logged on to www.flyskyjetair.com and book the sale tickets online. Payment of ticket booking can be made thru Credit Cards (Visa or Master Card), BDO, SM Tickets, 7-Eleven, Cebuana Lhuillier and other Payment Centers. You may contact Skyjet Airlines hotline number: (02) 863 1333 for any inquiry. Grab this opportunity to get affordable fares to these Philippine famous getaways. Book online from August 17- 20 for the affordable fares. If you wish to get the lowest fare, book as soon as possible. Sale tickets have limited availability. Do you need more airline seat sale and promo fares 2017 to 2018? LIKE and FOLLOW us in Facebook: PISO FARE TICKET for promo updates and travel tips!! !